Just like everyone else this time of year I am working on my New Years Resolutions. Lose the rest of my baby weight, learn to crochet more than a scarf and cleaning my studio are all on the list amoung others. Actually the one about the studio is at the very top of my list. 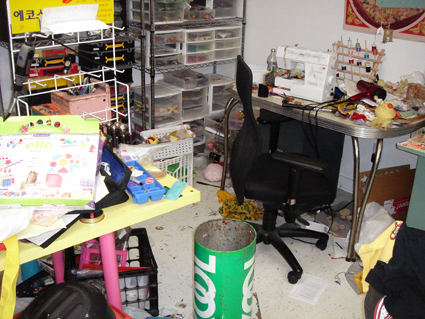 I have never been one to keep my crafting space clean. You have probably heard me talking down my nose about crafters with meticulously organized and clean craft spaces. However, with the arrival of Tallulah last year my studio has gotten out of control messy. Possibly the worst it has ever been. To the point where I feel stifled in my creativity from the clutter and can’t find anything. 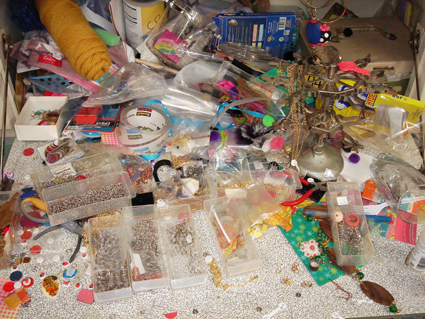 That being the case I am determined to start 2010 off with a clean and organized craft space. I’m not saying it will stay that way long, but at least it will get a good scrub down to start. Let me catch you up to speed on my studio. Naughty Secretary Club headquarters used to be in the master bedroom of my house. Pick up a copy of Handmade Nation to see the old digs in it’s full glory. 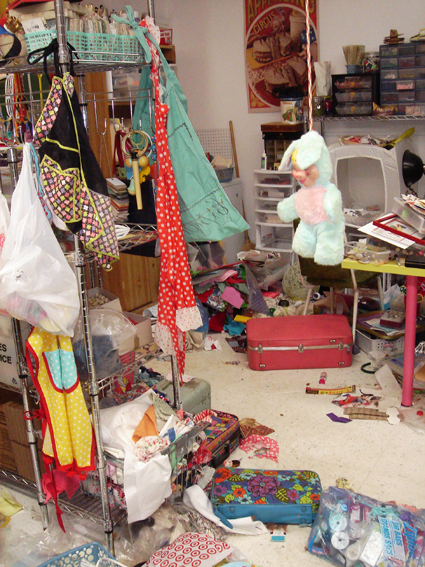 True story: I refused to be interviewed in my studio for the Handmade Nation documentary because it was so messy, boy do I regret that now. Eventually I converted my 2 car garage into my new studio. You can see the before and after pictures here. If you can believe it these pictures were taken a few months ago and the studio looks even worse as I type. Now there are Christmas decorations, lamp shades and displays from various holiday craft shows that need to be put away in the attic. At this point you are probably thinking to yourself, why in God’s name is she showing anyone this hell hole? Well I’ll tell you. I have decided through the month of January I will give you the readers a weekly pictorial update on my progress. That way if you are watching I will be pressured to really get things picked up and organized. I’m also planning on posting pictures again in June so you can get a 6 month update. The reason why it might take me a month to clean my studio is le’ bebe has wittled her nap time down to a mere 2 hours a day and my last hope at an assistant (AKA my sister) has long since quit coming for the most part. Most naps I have to put together orders, get the house picked up and answer work emails. Cleaning my studio has fallen to the wayside. It’s not like I can bring Tallulah into the studio with me it’s choking hazard central in here. Although I suppose I could set up a play pen if there were enough clear space which at this point there is not. In the meantime I am asking for any and all organizational advice. 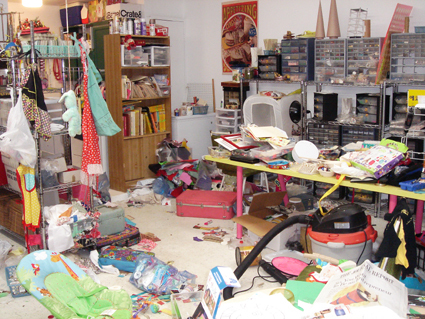 How do you keep your craft space clean? I can hear my dad lecturing me about cleaning my room as a child “A place for everything and everything in it’s place”. Wish me luck and I’ll be back next week with hopefully some cleaner pictures. Posted December 29, 2009 & filed under Home Decorating. Yep, already started. The Man bought Me a new work bench with drawers for all My beads and tools. The process of trying to decide what goes where is the hard part and am I in a hurry! I've got things to Create! I like how you and I can't actually commit to getting anything done, unless it's on a public forum. LOL. Good luck with Project Clean Up! Emarci it's funny I just got back from going to Wal Mart with my husband so I could buy storage bins to start my cleaning and organizing and he kept mocking me saying "more purple crates". Actually one of them was purple! jennifer, i commend you for sharing this. you are a brave girl. i hope to get through my embarrassment about my craft space(s)now. i am like pig pen on the peanuts cartoon. can't find that one thing….better go buy another…. thank you again, you are very inspiring! That little rubber faced blue bear hung himself because it's so messy out there. I'm now feeling a little better about my studio. so glad not to be alone! it takes time but worth it! good luck! I am a Professional Organizer and a crafter, so I can relate to many of the issues people have brought up. You want to keep your creative juices flowing and you don't want to stop. Yet you need to be able to find your tools and supplies so you don't go buy more things needlessly. Oh Chris – shut it. You are going to have to find something new to nag me about once this room is all clean and shiny! I absolutely agree with not expecting this to get clean in one day. It took a while to get there, and it will take a while to get back. Brightly Colored Large Labels‘, label every one of those grey see thru drawers. That way when your across the room you can see the color of the drawer and automatically know what's in it. More open shelving for larger swatches of fabric and group all your open canisters’ in the same area. Butm yup, small bites…allow yourself a little create when you find something you'd forgotten and just MUST use! Itll take ages…thats fine because if you do it too quickly youll never find anything again. Have you got enough space to make areas that you tidy, so that you make a little oasis of space? I think I am going through the same thing. I make the same resolution every year and nothing changes. I've been through all of the ideas as listed and still feel like a slob. I'm thinking once a year I will just get rid of it all and start again. That's right after I open my new purchases from ebay. Happy New Year and I love your site. Lady! My studio is just the same if not worse! At least you have shelving! I thought mine was bad but I actually gasped when I saw your pictures! I'm looking to you for inspiration! I can relate, my craft cabinet has stuff literally flying out of it when I open the doors. Funny to say open when the doors won't close completely. Good luck with your cleaning. By the way, why is there a rabbit doll hanging by what looks like a noose? after all im not the only one !!! i dont have a craft room , so my stuff is either in my room or in my living room causing some problems with my mom , because of the mess lol. Glad to know it's not just me. Good luck with your mess, and good luck with mine. yep…looks just like my space. Except I have more glass than anything. Child please! 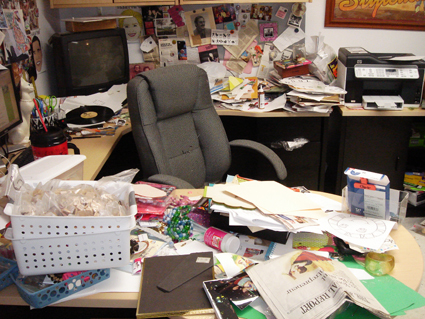 Your space is a hot mess and so is mine! I might need to join you in the reorg. effort My husband would be happy. I need to get it cleaned up in time for Baby B-diddy's 1st birthday party in Feb anyway. You can do it!!! Mine looks the same I know I need to get organized. Sometimes we buy the same supplies over again because we can't find the ones we bought. Well at least they will always come in handy especially when the money is tight. I can't wait to see the updates! I hope you're not really smoking KOOLs in there-fire hazard. xoxo – thanks for sharing!!! My hubby just helped me get organized — I second Ikea, I see that you are in Austin like me! The Container Store near the Arboretum is having a 30% off elfa sale — woo hoo! I feel like I am in perpetual organization mode, looking for the best way and container to organize. 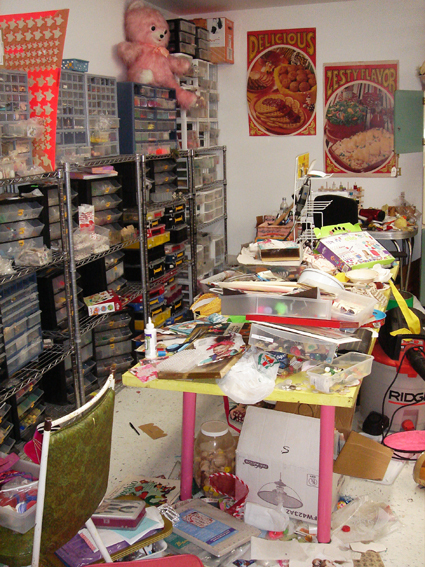 Sometimes I think I should apply to be on that hoarders show I have so much stuff to craft with. Question:what do you do with your old organizing containers? my advice: I think you need a purple crate. good luck with the clean-up, missy!